This interior section of Westport did not develop a core area of settlement as early as some of the other sections of town. Instead, this zone is characterized by nineteenth- and twentieth-century residential clusters, and by the corridors surrounding Route 6 and Interstate 195. The construction of the Old Colony railroad across Watuppa Pond spawned the development of a small recreational hamlet in the 1870s. The completion of the railroad bridge divided South Watuppa Pond and created a protected water body that became known as Middle Pond. This area, which became known as “The Narrows,” developed almost immediately with the construction of two boathouses on the east and west sides of Middle Pond. Summer boating and fishing, and winter skating drew many of the town’s residents and people from neighboring communities, and led to the construction of numerous casinos and clubs on the waterfront. In the 1940s the Narrows was a magnet for the town’s nightlife, drawing crowds with professional singers, comedians, and dancers. The construction of Route 195 in the 1960s resulted in the filling of Middle Pond and the end of the Narrows as a thriving social center (Maiocco 1995:73). 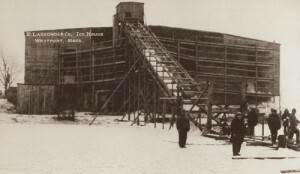 The Narrows also supported several ice businesses run by the Lassonde and Ouellette families. Large wooden ice houses were constructed near the water and huge quantities of ice were cut and stacked in January for year-round delivery (Maiocco 1995:72). A major settlement node in this portion of Westport was the nineteenth-century community that grew at the intersection of Old Bedford and Blossom roads. Sanford Road also developed early in the historic period and was dominated by the Borden family homestead. The Bordens first came to Westport in the 1630s (Maiocco 1995:73). Primarily an agricultural area, it was remote from the major fishing industries clustered at the Head of Westport and Westport Point, as well as the industrial village of Westport Factory. 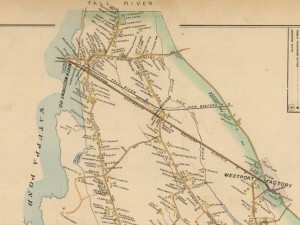 Its location at a crossroads leading north and west to the urban center of Fall River, however, meant easy market access for the products in this region and contributed to Westport’s continued strength as an agrarian-based economy during the historic period. The area was dominated by several prominent families, and examples of the agrarian settlement pattern include the circa 1850 Gershon-Wordell Farm. The concentration of families in this area led to the establishment of a cemetery in 1840, the erection of a Baptist Church in 1858, and a small school around 1871. The cluster of structures that comprises the Brownell Corner Historic District is partially located along the southern boundary of this zone. 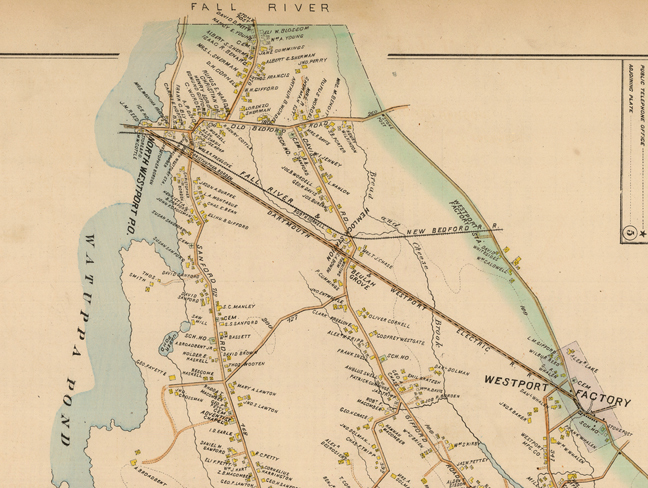 Although Cadman’s Neck is associated with the late-nineteenth-century camp meeting in Westport, a second camp meeting was apparently organized in North Westport. Known as Beulah, the meeting was reported to have occurred at the northern end of Gifford Road (Smith et al. 1976:44). No additional information about this religious gathering was collected as part of the survey. Large farms characterized much of this zone during the historic period. One example is the Sampson Farm located at the intersection of Blossom and Old Bedford roads. The family farm has its origins in the late nineteenth century and by the 1920s was a major producer of potatoes, as well as cattle, horses and other vegetables (Maiocco 1995:77).